After a long winter in the Upper Midwest, as soon as spring hits I’m all about flats. I hate sandals because I feel like my feet get dirty in them (is that totally weird? ), so I have a huge repertoire of flats that I wear daily. Buuuuut… some flats can get a little manky if you’re not wearing socks. YEAH I SAID IT! And no one wants that. Enter: no-show socks. They are totally essential. And what’s even more essential are cute no-show socks–because when they don’t show, you can sport all kinds of crazy designs and colors, right? 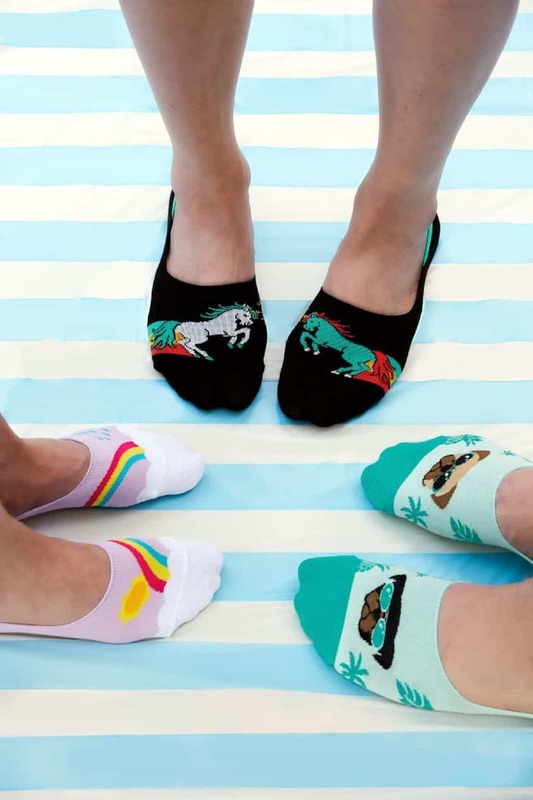 Our friends at Sock It to Me have you covered with their super fun no-show socks–the rainbow and gato libre ones are my personal faves. Each pair features fun and different mismatched designs with the left & right foot complementing one another and a no-slip grip to keep them on under your shoes. I should also mention that my 3-year-old absolutely obsesses over her Sock It to Me kids socks–and the knee highs look completely adorable with a pair of shorts. So! Much! Fun! We’re teaming up with Sock It to Me to give one lucky Hello Glow reader a $200 gift card to buy anything their heart desires from their online store. Yes! Kids socks, women’s socks, men’s socks, underwear, whatever you need! Enter using the form below. Good luck! Awesome selection of no show socks! really funky designs you have there too! The men’s Constellation style in socks is my favorite. I love bumper sloths and winter raccoons! I like the Tale Of The Red Panda socks. They are so cute! My favorite is the Keep Dreamin’! I like the Men’s Constellation design socks the most of all the products as featured on the Sock It To Me website. I love the Men’s Constellation socks! I absolutely love the The Ecstasy of Mr. Wavy Arms! So funny and adorable. STRETCH-IT™ Rainbow Blast!!!! I love so many! Man Cave is my favorite design. I love the Chew on This socks! The glazed galaxy ones my youngest daughter would go crazy for. I think they are really cute! the Chew on This crew socks are my fave! i like the Argh Ye Stripey Toddler Crew. I like the “Sun’s Out, Pug’s Out No Shows”. I love the Snackin’ Sloths knee highs and the Kitty Willows is sooo cute too! I like the Hedgehog Heaven design. I really like the Carousel design. I like the Burger & Fries no-shows. I like the Grant Thackray.. I am loving the Over the Knee Black and White socks. So cute! I like the Raining Cats & Dogs socks. I really like the women’s Florida socks because I just love flamingos. I like the Land of the Dino for the kids. I like the End of Raintoes no show socks! Bearly Sprinkled Youth Crew are just too cute! They are my favorite! My daughter would love the sock with the cats on them! I love the design kick it youth knee high! They are all very cool designs! My favorite design is the party animal. My favorite design is Party Animal. I really, really adore the Ask a Question socks, oh wow, so cute. I love their lightspeed socks. They have so many adorable patterns! Land of the Dino knee high socks are so cute! I like the Keep Dreamin’ socks a lot. Oh my I Love the Land of the Dino knee high socks!! I love finding fun print socks! I like those Albert Einstein socks! Tiki Tush Underwear is my item of choice! I like the red panda knee-high socks. I love the women’s Wine crew socks! i love the punk poodle socks. they are adorable. i would totally rock them. I like the 321 Lift off socks. I love the Keep Dreamin’ knee socks. I like the Princess of the Sea. The Gato Libre no shows are the best! I love the Purrmaid Knee High socks. I also love the Dancing Dolphins. The Pug socks are cute. These are fantastic! The Bees Knees are adorable. I LOVE the Gato Libre no-shows! As a photographer I like their “Say Cheese!” socks. Thanks and God Bless! I really like the Carousel Youth Crew. I love the Bee’s Knees design. BUMPER SLOTH NO SHOW SOCKS are simply adorable! I like the 3-2-1 Lift Off Outer Space themed socks! I love the “our powers combined” socks! I love the cat eye socks! My favorite ones are the women’s Wine crew socks and the men’s bowling Spare Pair crew socks. I like the Plume knee highs. One that I really like is the Lightspeed No Shows design. Burger and fries, for sure! I like the Batter Up crews. Suns Out, Pugs out is adorable!!! The constellation socks are nice. Turnip the Beet are my favorite. I love socks and those are so cute! I really like the Ruff Bluff socks! So funny! i love the “Our Powers Combined” No Shows! I really like the Gato Libre No Shows socks. I like the Our Powers Combined socks. Very cute. I love the princess of the sea crew socks. I love the “our powers combined”! Unicorns are my favorite! My favorite design is the Sun’s Out Pug’s Out no-show socks! I love the Happily Ever After design. I love the burgers and fries socks! I like the Sun’s Out, Pug’s Out No Shows socks. thank you! I love the music themed socks; saxophone, trumpet and all! I love my smooth jazz and these socks would let the world know just how much. I love the jackalope design. I absolutely adore the 3 2 1 lift off socks! I choose burger and fries–no show socks. I love the Turnip The Beet knee highs! I love beets and those are such a cute conversation starter. So many great designs! The space cheese really stood out. I like the Bearly Sprinkled they are toooooooo cute. I really like the no show versions of socks. They are convenient and sparce. Not adding any warmth during the summer months. Love the bright colors. I love the cute Jackalope socks! They are fabulous! I like the Sun’s Out, Pug’s Out No Shows. I love the constellation or the lift off socks. Space is so cool! The Intergalactic ones are pretty neat looking! The jet setter socks are to die for! I love the Kitty Cone knee high socks on the site. The Costume Party socks are so cute! I like the Space Cheese socks. I love horses so my favorite is Our Powers Combined No shows. I love the STRETCH-IT Stay Weird! So cute ! I love the Large Bikes sock design the most! I love the Lightspeed No Shows design. I love the 3, 2, 1, Lift Off socks! I like the Carousel crew socks. My favorite design is the Whack a mole socks. I really like the Stella Whales design for the women’s socks. My favorite is Dress Up Meow. What a fun website! My favorite is Bearly Sprinkled. They are all cute maybe the cheese. I like the Dress Up Meow design. My favorite is the Our Powers Combined No Shows socks. What a great selection of socks.